Back in the old days –the late 1990s– I fancied I was different from your average Western expatriate in Mali. As a Peace Corps Volunteer, I was meant to “live at the level of the population,” to borrow a phrase popular in Peace Corps official discourse. Out in my village in southeastern Mali, I indeed slept under a thatch roof, showered from a bucket, used a pit latrine, got around on my bicycle or on public transport, and ate what my village host family cooked for meals. So I rather looked down on those “expats” in the capital, living in their air-conditioned villas, riding in chauffeured SUVs, buying overpriced corn flakes at the Lebanese-owned supermarkets. Am I one of them now? As a Fulbright Scholar in Bamako, I don’t exactly live like my compatriots who work as diplomats or aid workers. But I do live pretty well. 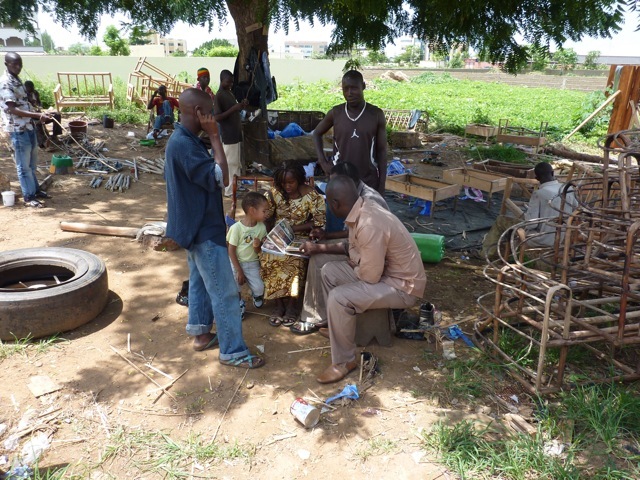 After arriving here in August 2011, my family and I took about two weeks to find a house that was suitably situated in the Badalabougou neighborhood, close to the Niger River and the university. The place is modest by American standards–three bedrooms, a double parlor, kitchen and two bathrooms. The rent is less than half of our monthly mortgage payment for our house back in Bethlehem, Pennsylvania. But it still qualifies as un villa in Mali, since it’s made of concrete instead of adobe and thatch. We don’t have to go outdoors to get water or use the facilities. The floors are of ceramic tiles rather than packed earth. Our dwelling is normally home to six people, two to a bedroom: my wife Oumou and me, our children Rokia and Zachary, my wife’s sister Dourou who studies at the university nearby, and Bah, our baarakela or live-in domestic worker. 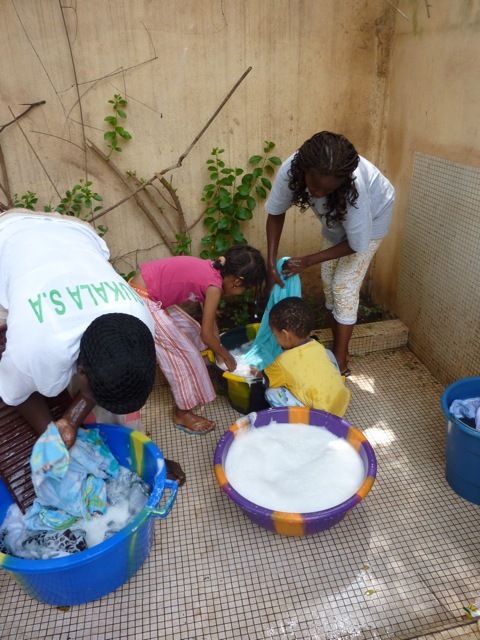 Most Bamako households that can afford to do so hire a baarakela to help out with cooking, cleaning, laundry, etc. They are usually teenage girls from rural areas with little or no schooling. Bah, who comes from Oumou’s mother’s family, at least finished eighth grade. She arrived in Bamako for the first time just this month. Most baarakelaw get paid the equivalent of US$15-20 per month, plus room and board. When I suggested that we might pay ours a little more than this, my Malian friends warned me not to: If you’re too generous with her, they said, she’ll get lazy and spoiled. To think that 75 cents a day is generous! A new, Chinese-made refrigerator, from the shop of a guy my friend Bakary knows (they’re from the same village). Mattresses for everyone. These are made in Mali by a company, Fofy, that seems to have a virtual monopoly on the mattress market. The prices are somewhat standardized, so there is not much room for bargaining. Rattan furniture, which we ordered from a local craftsman at his outdoor workshop. This order consisted of beds, a dining table and chair, a couch, loveseat, two armchairs, a coffee table and an armoire. Oumou haggled long and hard on this order, and its fulfillment has been a very long, gradual process. One month later, we are still awaiting the last item. With these steps complete, we turned to smaller acquisitions (kitchen and dining utensils, bedding, and appliances) to add to what we’d brought with us. 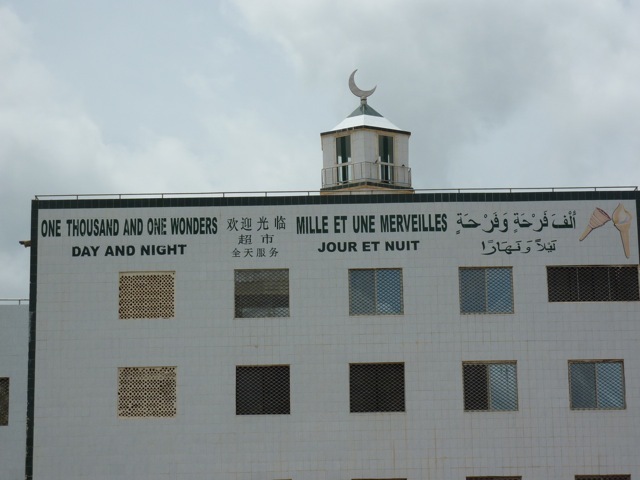 One big discovery during this stage was a rather new retail business known as “A Thousand and One Wonders,” which may be the closest thing Bamako has to a department store. 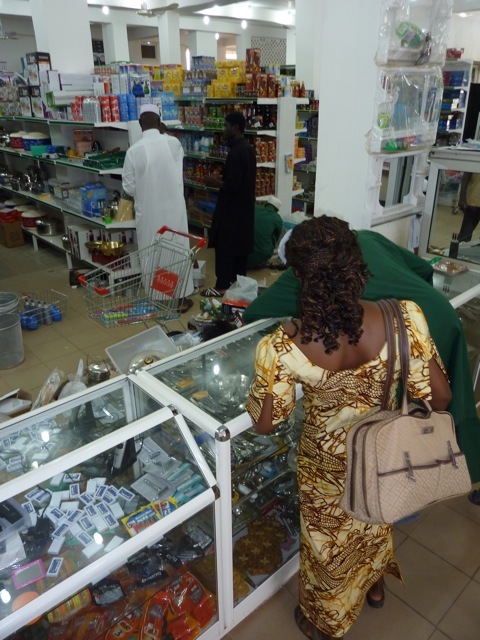 Heretofore, when shopping in Bamako, you’ve generally had to go to a multitude of small businesses to find what you’re looking for. “One Thousand and One Wonders” now offers one-stop shopping for housewares, appliances, and dry goods. Some of the Lebanese supermarkets are going this route too, with expanded housewares and appliance sections. You may notice this building’s outward resemblance to a mosque. In fact there is a mosque on the premises, and the store closes for each and every daily prayer, as businesses do in Saudi Arabia. This is most unusual in Bamako. The owner clearly has been influenced by Saudi-style Islam in how he dresses and runs his shop. The most recent step in our settling-in has been getting a television. We opted to buy what’s known here as casse (imported used, usually from Europe) rather than new. A 21-inch Philips model cost a little over US$100. 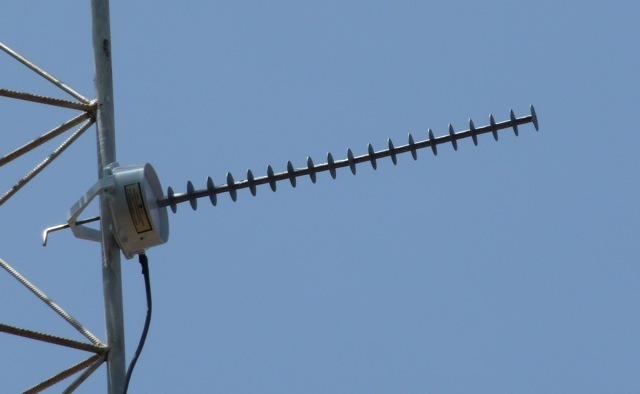 For another $20 we purchased a “TV cinq” antenna, and paid a specialist about $4.25 to rig it up properly to our rooftop mast. 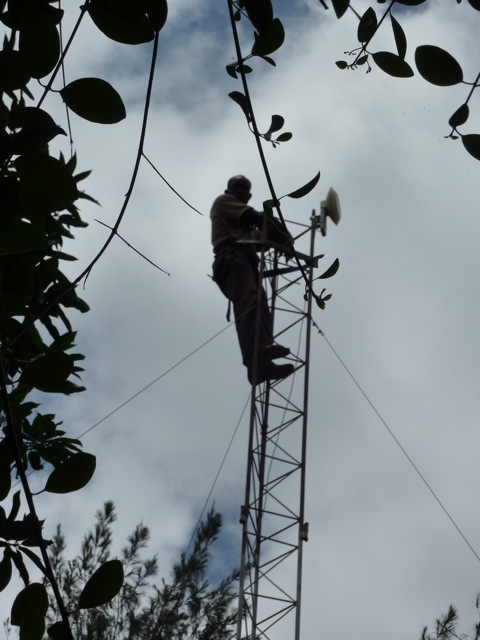 We now receive three channels: the French satellite channel TV5, the Malian government station ORTM, and a private West African company called Africable. Good for news programs, a variety of telenovelas, and even occasional episodes of American shows like “Army Wives” and “Criminal Minds” dubbed into French. Bah especially likes the telenovelas. But we are trying not to spoil her. We haven’t yet acquired an air conditioner, as the temperatures have been mostly bearable. But that will change in a few months. 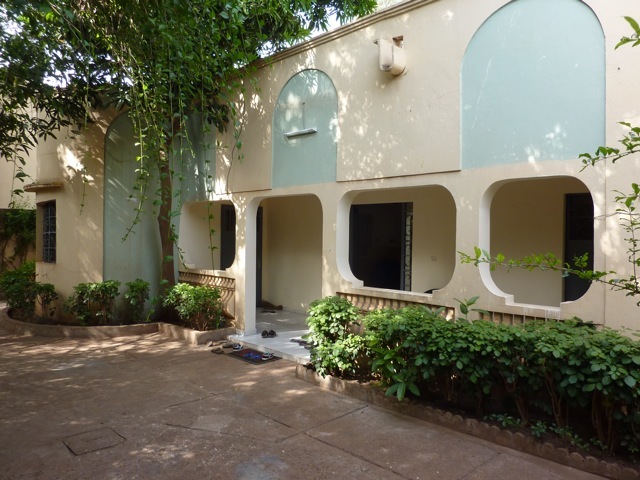 By then, I may have completed the transition from “living at the level” to “living like an expat.” What will this transformation mean for my ability to observe and participate in the life of the Bamako residents around me? Will I find myself trapped in the dreaded “expat bubble,” relating primarily to other outsiders like myself? Of course it helps that I’m married into the local population, that I speak decent Bambara, and have acquired years of life lessons about Malian society. And I still don’t have a car, or even a motorcycle, which means lots of rides in taxis and “Sotrama” minibuses. While I’m on guard against letting myself get too comfortable, I feel I’ve already started down a slippery slope…. This entry was posted in Uncategorized and tagged bamako. Bookmark the permalink. 1) All countries teach their citizens to love their own country/culture. Any bad outcomes in history will be blamed on the “other” party. In the case of Mexico, I can think of losing half our land (to the US), our gold (to spain), etc. The US obviously does not think they “stole” any land from Mexico. People view history very differently. Americans don’t understand why Mexicans are so unhappy with the way things turned out because the US version of history sees the event as humanitarian (the idea is that Mexicans were horrible to the people on the north and Americans saved these people – the US typically ignores slavery when they speak of how poorly people were treated in Mexico). In addition, it was part of “destiny” for the US to take over other countries. Mexicans definitely are not taught the US was “helping” the poor people of the north and they certainly do not believe that it was destiny for the US to take over half of Mexico. The way the US teaches the atomic bomb in Japan is also VERY different to the way it is taught everywhere else in the world. Things are complicated. I agree. But what is also true is that I do not blame foreign countries for teaching a different history that builds their own nationalism. All countries are proud of teaching a nationalistic history – even if that means that you will be overly biased in the way you teach your history. 2) Everybody agrees that the US does what is in the best interest of the US. That may not always be in the best interest of a specific country in the long term. For example, I read some people in Pakistan do not support the US because they are afraid that they do not have the resources to fight terrorist groups once the US finds that the US is not in danger. In other words, the US would like for all Pakistanis to fight against terrorism. They will even give them tools and money because the US is afraid the terrorist groups may be able to attack the US. What happens once they are too weak to attack the US? It is in the best interest of the US to stop helping the Pakistani government until the terrorist group becomes powerful again. Why would a Pakistani help the US only to be left out in the cold once the US leaves because the terrorists are no longer a risk to the US? The Afghani guy just came out saying that he would not support the US if the US were to attack Pakistan. Do you blame him? If Pakistani terrorist cells moved and started attacking Afghani bars, would the US send people and money to help find the responsible parties? I doubt it. 3) In the end, people want to be proud to be unique and independent. All countries want that – including the US. Even countries that want a democracy want their own democracy (surveys say time and time again that Saudis want democracy but they do not want the American democracy). When a specific country tells you that it is best to do things their way, most will just react and say they will do it a different way. Most Americans still believe the American dream is possible – you can start poor and reach the top. That is why the government does not need to set up a level playing field in education, housing, health care, etc. – because everybody can make it to the top in the US. Most Americans believe this does not exist in other countries for one reason or another. Some countries cannot achieve the American dream because they are simply too poor. In others because markets are weak (which means you cannot find banks to fund ideas). Finally, in Europe, because regulations and taxes prevent people becoming ridiculously rich because of their creativity. Anyways, those are just some thoughts on how you can grow up to disagree completely with the US or any other particular country/culture…. 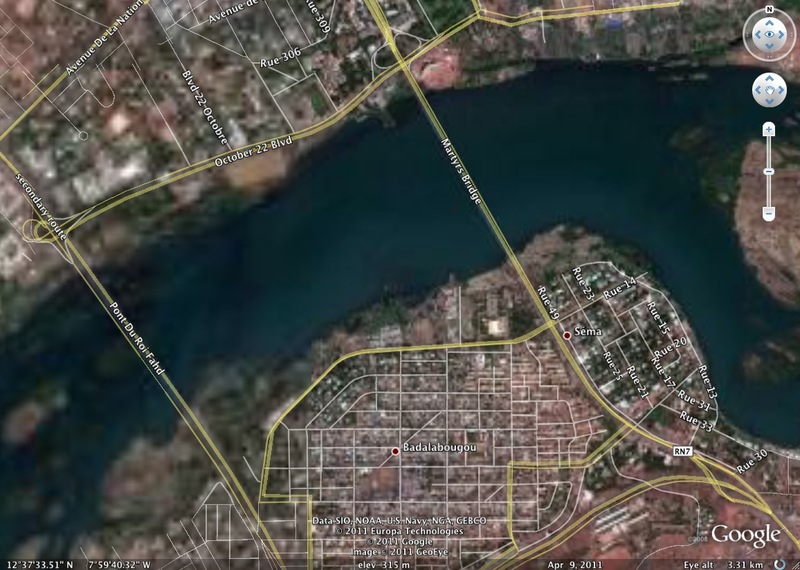 I would love to relocate with my new Malian wife to Bamako from Canada, but have no idea where to start or what I would do when I got there. Any tips?